Ariki loves the ocean, she feels alive and free as she dives through the water, her eyes taking in the coral, fish and sharks as she swims and plays. She doesn’t fear them, she knows how to handle the ocean and its creatures. Ariki is different from the other kids on Turtle Island. For one, she wasn’t born there, she arrived as a toddler, washed in from the ocean in a cradle tied to a raft. Her tribal tattoos are also different; she is a stranger from across the seas who is drawn to the ocean. The people of the island are struggling. The rains have not come and food is becoming scarce. When giant shark they've never seen appears, the people are scared. The young Queen thinks that the shark is to blame for all their problems so the people prepare to kill it. Ariki knows in her heart this is not true. She feels a connection with the giant shark and is sure it is a peaceful creature. How will she convince the other islanders before it’s too late? This is a beautiful and mystical book that will appeal to a range of primary school readers. It has a relatable main character, an easy to follow story and enough suspense to carry you through to see if Ariki can make the Queen understand what she knows about the strange new shark. Nicola Davies’ books always capture her affinity with nature and her deep understanding of how humans and nature are part of a greater whole that needs to work together. This story touches on cultural connection with land, sea and sky and opens kids’ eyes to how they are all connected. 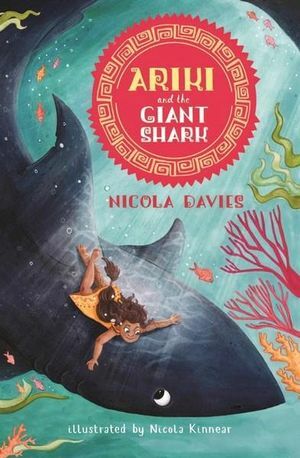 It is interspersed with beautiful illustrations from Nicola Kinnear that capture Ariki’s feisty personality and show us how content and happy she is when in the ocean. This is a relatively short illustrated novel that would generally be described as junior fiction. However, there are surprisingly complex themes in this little book and more advanced readers will follow a deeper level of understanding as they engage with Ariki's emotional journey. This book also provides a platform for opening discussion about different cultures and how island cultures work together with the ocean and sea creatures in in their everyday lives. Another interesting discussion point is how most of the adults in the story are willing to blindly follow the Queen's direction to attack when they come across something different and it takes the children to realise that there may be another way. This is a lovely little story that was a joy to read and I look forward to the future instalments of the Ariki series.